First, don’t be alarmed by the giant hole in my floor! 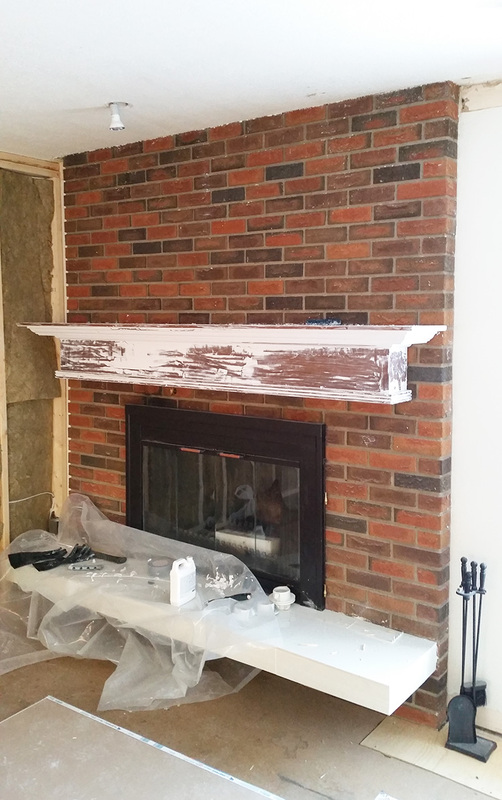 It was just one step along the way to getting the painted brick fireplace in the bedroom of my dreams. See, this fireplace wasn’t always sitting in my bedroom. It was once in my living room. No, we didn’t move the fireplace, we moved the room! (This post may contain affiliate links. This means, should you end up making a purchase, advertisers give me a small percentage of that sale, at absolutely NO EXTRA COST to you. Click here for full disclosures). This was the day my house stopped being my house and it instead became a construction zone. And, though it may sound crazy — I was so very happy to see this hole in my floor. This hole marked the spot for my brand new staircase. (Yep, we moved the staircase too). And that big red “X” in my photo? That marks the location of my new bedroom wall, forever changing this end of the house from our out-of-the-way living room, to our cozy master bedroom. The walls were going up, and I was realizing my once red brick fireplace and painted white mantel wasn’t going to cut it. Everything in the now smaller, now dimmer, room, became very orange as light bounced off the fireplace. Plus, my white mantel was looking strangely too regal for our slightly more calm and boho inspired sleep space. Did I mention just a year previous I had just completed this fireplace makeover? We scored that chunky mantel (in a natural wood tone) at a garage sale for only $100, and we used plain pine boards from the hardware store to build up the vertical pillars and added the dentil moulding. A makeover that never made it onto the blog, but you can see it stealing the spotlight in this –> Christmas blog hop and home tour. We were happy with it, and I loved my natural brick… until I didn’t. Enter the stripping supplies. Time to get that mantel back to it’s original stain with a lot of elbow grease (and a lot of stripper). Apply stripper and let it sit, scrape with your tools, and repeat. (Be sure to use safety when dealing with stripping chemicals and dispose of your materials and waste in accordance with your local safety and environmental requirements). The photo above is after the first pass. At this point is always when I ask myself “what did I get myself into”. I know I’ve had this thought many times and written this in my blog before too… but I continue to get myself into these situations. But I gotta admit, the payoff is always worth it! About three passes later, we’re starting to look pretty good. Each time I would add a little stripper, and let it sit. Next, I’d take to it with my scrapper, and stripping pads. At last, it was time to break out my trusty Dremel to dig the remaining paint out of the carved details in the mantel. Works like a charm! Once the mantel was clean, I sanded it a little deeper, and added a fresh coat of stain. Back to it’s original beauty. And I was loving it. Now the super easy part… let’s just whip through painting this brick shall we? Do you sense the sarcasm? Warning! Painting brick isn’t even close to painting a wall. I used a great moppy roller, and that was perfect for the surface. But the mortar was a killer. That’s all hand done, with a paintbrush, and about 10 hours later. I had it covered. All 40 square feet of it. But — if you’re using the right paint (Masonry), it actually goes on with great coverage, and you can be done in one pass. Phew! At this stage I was feeling pretty happy. Until we were informed our fireplace was unusable and to meet code we’d need to permanently build a blocking structure to keep it from ever being used with real burning logs. This is the “.5” of the “2.5” makeovers this little beauty received. Building our insert involved removing the black doors and frame at the front of our fireplace, which revealed more brick. Time to bring out the paint can again! Thankfully this little bit was not much to tackle. But how about that hole? We chose to build this incredible fireplace insert out of wood slices from a birch tree on our property. And, it truly needs a post all of its own, so I promise I will share how we created this beauty really soon. (*UPDATE*: See the wood slice fireplace insert, how-to here!) In the meantime though, I’m so happy our little fireplace is done. It’s serene, it’s bold and it suits our bedroom 100 times better than the “old” one ever would have. ^This view^ is what I see when I force my peepers open each morning. Not half bad. I’d say it’s a pretty incredible sight to start my day with some serious positivity. One corner of the room is complete at least. And, we’re actually sleeping in a bona fide bed these days too (after 5 months of cabin life on a mattress on the floor). So — I’d say the room is making some real progress… buuuuuut… not enough to show any other angles in the space, at least not yet — (but you can spy my new bedding in this pic). Let’s just take another look at that cozy finished corner shall we. Take a deep breath in, and let out a big “Ahhhhhhh”. ‘Cuz that is just how this painted brick fireplace makes me feel. Looks awesome!! What color did you tint the paint, just plain black? Thanks Mike, yep, it’s just a flat black, and I used a special Masonry Paint from Behr. Behr’s “Masonry, Stucco and Brick” Thanks so much! This turned out amazing! Crazy how painting it such a dark color makes the whole space seem brighter, the transformation of this room is beautiful! This is GORGEOUS! I told my husband already that I want to figure out a way to make one of those inserts for our (working) fireplace for the off season! What a journey! I like that a “simple” wall switch was all it took to get it in the room. Much easier than moving chimneys and such. Love the black with the wood slices. Why was it deamed unusable?Does paingint it have anything to do with that? Our fireplace was painted creme color by the previous owners and we are trying to figure out how to get it back to brick color but we have no idea how to do that. Otherwise thanks to your post I think maybe we could paint it another coler. Gorgeous!! I love the black with wood tone!! Love it…love it…love it! Pinning! This looks SO good! A lot of work to get to this point, but worth it I’m sure–because it looks amazing. So much better than the old fireplace. Thanks so much Kemley! It was a lot of work but we’re loving it!